No one envies a soldier’s mother. Danny at his pre-military training camp. It’s because my son Danny, who turns 19 soon and who was diagnosed with autism at the age of 3, can’t serve. He can’t be drafted and he can’t volunteer. 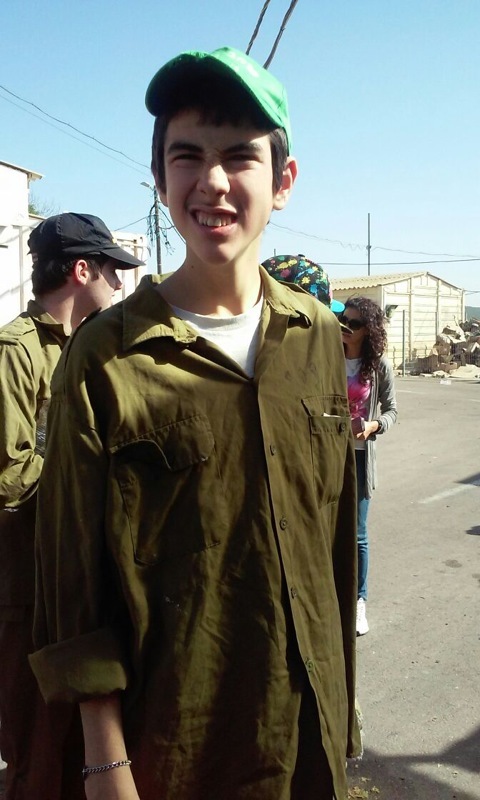 Although just last week there was a news item about a high-functioning young man with autism distinguishing himself in the Israel Defense Forces military intelligence unit, Danny needs too much supervision to be a part of the army. Danny can’t even cross the street by himself, because he is too easily distracted to take note of oncoming traffic and the colors of stoplights. He can talk more easily about a beloved cat that died 12 years ago than he can about what he did this morning. Of course I don’t want him to be in the kind of danger he would be in if he served in the military and I have nothing but compassion for parents who worry about their soldier children every day and night. When I tell them he isn’t in the army and why, there is usually polite silence. The truth is that for Danny, not being in the army is not a problem. Although he is fully bilingual in English and Hebrew, can read and write and has a phenomenal memory, he doesn’t seem to fully understand that he is an adult. At synagogue, he finds himself drawn to much younger children, and seems to see them as his peers. On some level, of course, he does realize he has grown, but any time I try to have a conversation with him about it, he cuts me off, saying, “I don’t want to talk about it.” He knows, and he doesn’t know. I also know, and don’t know. When I wrote a novel, If I Could Tell You, about four families whose children are diagnosed with autism at the same time, I deliberately chose not to set it here in Israel, because I was not prepared to deal with the issue of military service. I guess even then I didn’t want to think about it. In an article in The New York Times Magazine last July, Ruth Padawer wrote about children with autism who eventually lose their diagnosis. What many people got from that article was that approximately 10 percent of children with autism grow out of the diagnosis. What I got out of it was that 90 percent didn’t, even when they received identical treatment to the 10 percent who did, exactly the kind of treatment that Danny has gotten. Even the experts quoted in the article couldn’t say why things turned out this way. The publication of this article came at a very difficult time for me. There were many changes at Danny’s school because of the Israel-Gaza war last summer, as teachers were called for military reserve duty. For a complicated set of reasons, the afternoon program at his school was closed for the duration of the war, and all the changes were very stressful for him. His tantrums became much more frequent. When an 18-year-old has tantrums like a toddler, it’s much harder to handle. I was still dealing with the paperwork to become his legal guardian. Reading about the lucky 10 percent couldn’t have been more discouraging. It was a particularly crazy time for me to wish that Danny could have been part of the military. Yet I did, intensely so. It was hard for me to talk to friends with children Danny’s age, who had just joined or were about to join the army. My friends with 18-year-olds back in America, where I grew up and where Danny was born, were helping their kids pack for college. That’s really what most parents want for their children. And even though he can’t express it, on some level, I think that’s what Danny wants for himself. All the habits that go along with his autism, the need for routine and repetition, are ways that he soothes himself and keeps himself going. Hearing the same stories over and over helps him, and so does looking at snapshots every night of all the cats we’ve ever owned. He is often scared, as a soldier might be, and he is just as brave. He faces a tough fight every day, and I am proud of him.